- The sectional view of the lower jaw prosthesis shows a bar pilar on top of a conical titanium base with a fitting secondary unit. Firstly, model analysis is completed and used for setting up the denture teeth. The relevant primary and secondary framework can be designed after generation of the denture bases. Digitalisation of the functional models using a dental 3D scanner – this must not only record the topography of the model surface but also the position of the upper and lower jaws in the articulator. This allows both the relationship of the jaws to one another and also to the condyles to be recorded and transferred to the CAD software. Model analysis must be completed in the CAD software using the scan data and not only take into account the anatomical conditions of the edentulous jaw but also examine the given implant and antagonist situation. 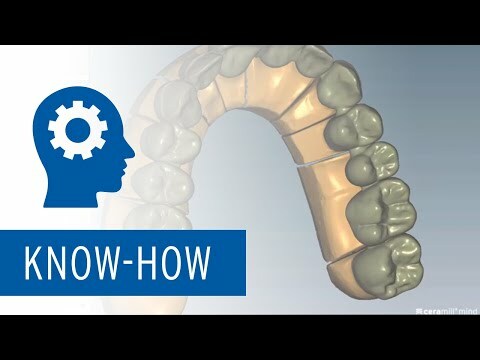 The user then selects a suitable set of denture teeth for the situation (best-fit suggestion integrated in the software) and the suitable occlusal concept. The teeth are then set up automatically – but can be adapted individually using different tools. As prefabricated denture teeth are used, they must be shortened both virtually and subsequently also on the physical teeth after setting up if they penetrate the alveolar ridge basally. When the set-up is complete, the gingiva sections are automatically generated in the software in the form of a denture base. The user can customise the suggested gingiva design using virtual freeform tools. A suitable socket is cut from the base for each tooth to enable connection of the denture teeth and denture bases. The implant module is used for positioning the titanium bases and the bar module is used for the bar. An interface between the two modules already exists – however, solutions still have to be developed for the fabrication of bar and secondary unit in one stage. Currently, this is still a great challenge for the entire process chain. Basal adaptations in this case would be massive on certain denture teeth. Digital adaptation to the secondary framework and CNC technical transfer to the actual tooth using a denture tooth blank has already been realised thanks to the development of the full-denture prosthetics module. The denture base must also take the substructure into consideration and relieve this area without undercuts. Four different datasets are created for the lower restorations at the end of the design. One dataset for fabrication of the denture base, one for adaptation of the teeth and one each that includes the geometry for bar and secondary unit.